Finance/Interest Charges are computed at the prevailing interest rate of 26.80% per annum, calculated daily from the date each transaction is posted to your card account until full payment is received, subject to a minimum fee of S$2.50. You will have 20 interest-free days to make payment before your next Credit Card Statement is generated. 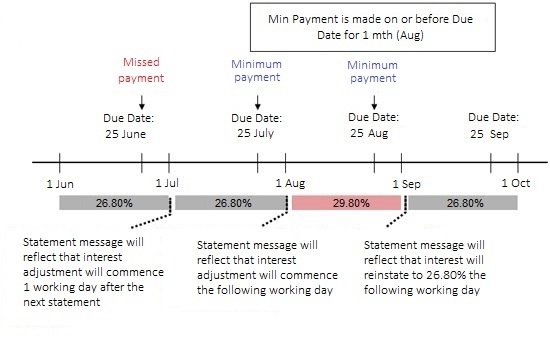 If you have not made the full payment by the payment due date, you will be billed for finance/interest charge on your next Credit Card Statement computed at the prevailing rate of 26.80% per annum, calculated daily from the date each transaction is posted to your card account. A minimum of S$2.50 is applicable for finance/interest charge. Make Full payment by the payment due date stated in your Credit Card Statement to avoid being billed finance/interest charges. 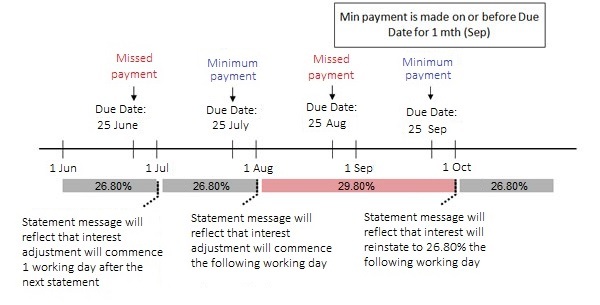 If you have not made the minimum payment by the payment due date, an increased interest rate of 29.80% per annum will be applied to your outstanding balance in your credit card account from the first working day of the following month after your next Credit Card Statement is generated. Interest rates will be reinstated to 26.80% per annum once minimum payment is made by the payment due date of the next subsequent Credit Card Statement. Example 1 - Minimum payment made by the payment due date of the next subsequent Credit Card Statement. Example 2 - Minimum payment missed by the payment due date of the next subsequent Credit Card Statement. Example 3 - Credit Card Statement reflecting adjustments to the prevailing interest rate levied on your card account.